Farzaneh Milani is Raymond J. Nelson Professor and Chair of the Department of Middle Eastern and South Asian Languages and Cultures. 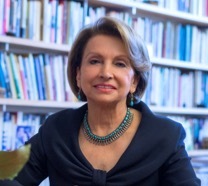 Former Director of Women, Gender, and Sexuality Studies at the University of Virginia, she has published several books, most recently The Literary Biography of Forugh Farrokhzad with Unpublished Letters (in Persian) and Words, not Swords: Iranian Women Writers and the Freedom of Movement; as well as over one hundred articles, epilogues, forewords, and afterwords in both Persian and English. She has served as the guest editor for special issues of Nimeye-Digar, IranNameh and Iranian Studies. She has written for The New York Times, The Washington Post, Christian Science Monitor, Ms. Magazine, Reader’s Digest, USA Today, among others, and contributed to National Public Radio’s All Things Considered. She has presented 240 lectures nationally and internationally. A past president of the Association of Middle Eastern Women’s Studies in America and a Carnegie Fellow, Milani was the recipient of the All University Teaching Award as well as the Zintl Leadership Award (2015).